A crispness in the air that beckons me to don jeans and sweaters and scarves and all kinds of plaid. That scent in the breeze that brings to mind apples, cinnamon and muffins in the oven. Oh my, I love Autumn. It is the one thing I miss about living in Florida. For the past 21 years I have gotten my fix by traveling north between October and November with a suitcase full of scarves, sweaters, muffin recipes and directions to apple orchards and cider mills. When the kids were very young we stayed with my brother-in-law's family. Once the kids were grown and I started traveling more independently, I usually stayed with my mother and sometimes with our daughter. My mother lived within walking distance of Central Park and our daughter lived across the street from a most beautiful park in the Bronx. My mom died last June and I was still too raw to enjoy NYC and the fall in 2012. Instead of going to New York in October we went to Washington DC. This year our daughter is in the process of moving into a new sublet so I cannot stay with her right now. My brother has two cats and my sister has a dog and cat. I have allergies - I cannot stay with them during seasons when the windows are closed and the heat is on. I really do not want to stay with anyone and have a family visit right now anyway. 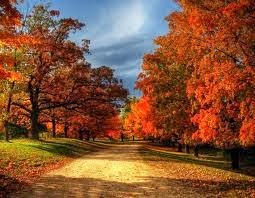 I want to simply be there and enjoy the sights and sounds and temperatures of a northeast fall season for a few days. I have a few days free on my calendar in October but I do not have the financial freedom. My husband gave notice to his employer last month. He is leaving his toxic state job to start his own legal practice as of November 30th. I figure we will have at least six lean months ahead. Now is not the time for me to take this trip. I will have to wait until next year. Still, I have this hole in my spirit that wants what it wants. I am not looking to eat maple sugar candy and drink hot chocolate fudge. I just want to breathe the scents of fall and wear a scarf without sweating. 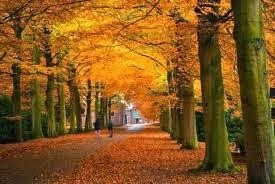 I want to see the glorious flame colors of trees that grew from nature and not from theme parks. Looking at photos and videos does not fill this hole or make me feel whole. Sometimes I have to deal with not having the food I want. Sometimes I have to let go of the false control I think I have over a person or a situation. I have to change my attitude and adjust my perspective. This is one of the times I have to change my thinking. I can do it without acting out with food. I want what I cannot have. If I accept that I can get over it. Acceptance is the key - always. Do you have to let go and accept something today? My heart sighed for you on this one. I love to travel to other parts of the country in the Fall, but it isn't in the cards this year. I've lived in or spent a few fall weekends in New York, Vermont, Colorado, and Virginia. Those are all very special places. But you can feed your soul closer to home and get a true fall experience. Consider a drive up to Georgia or Alabama's mountains. Watch the weather channel closely and drive up to Georgia when the temps drop. Our leaves peak later in October. We can still have days in the 80's in to November, but the cooler weather comes intermittently even now. I think the Warm Springs area which is more in the southern part of Ga has a somewhat mountainous feel. But if you could get to northern Georgia around Ellijay (apple orchards) or Blue Ridge, Helen, or Blairsville you could experience FALL-- wood smoke , train rides, and the hotels are not that expensive. There is a glut of vacation homes in these areas on line and we've rented a few different cabins in these areas that are surprisingly cheap. feed your soul..we can do it without food. PJ - I have been contemplating Georgia mountains. You have given me that little push to look at it some more. I will keep watching the reports for the peak and my calendar for the openings to travel. Even a weekend would be a wonderful gift to myself.